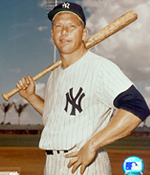 The greatest home run hitter in the history of the World Series play was Yankee great Mickey Mantle. “The Mick” cranked out a total of 18 legendary dingers while leading his beloved Yankees to seven World Series titles. Perhaps his most memorable post-season longballs was No. 16 (which surpassed Babe Ruth for the most all-time). Despite the fact that Mantle was nearing the end of his fabled career, and hobbled by chronic sore legs, he reached deep for one of his last ounces of Yankee magic in Game 3 of the 1964 World Series against The St. Louis Cardinals. Coming to the plate in the bottom of the 9th inning, with the game tied at 1, “The Commerce Comet” swung with all of his might at the first pitch from Cardinal pitcher Barney Schultz, a knuckleball that failed to move, and hit it into the right field stands to win the game for the Yankees. Ruth also pitched in two of the three Fall Classics in which he led the Boston Red Sox to World Series championships (1916, 1918), and he still holds the record for the longest complete game victory in World Series history. In 1916 Ruth pitched 14 innings to help the Red Sox defeat the Brooklyn Robins. He only allowed one run in the first inning, then settled down to shut out the Robins for the next 13 innings for the 2-1 win. The Red Sox would go on to win the Series in 5 games. Although Babe Ruth received the majority of the fanfare in the Yankee’s 1932 World Series sweep of the Chicago Cubs, the “Iron Horse” Lou Gehrig (honorary 500 HR Club member) was the true star of the October Classic. The mild-mannered Gehrig batted .529 with 3 home runs and 8 RBIs to lead his beloved Yankees to a world championship. Gehrig followed Ruth’s famous "called shot" home run with a towering solo home run, described by sportswriters as "The Thunder after the Lightning." Fueled by a nationwide TV audience, the legend of “Mr. 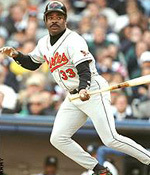 October” reached its pinnacle during the 1997 World Series, when he became the only player to hit five home runs during a single World Series. On October 18, 1977, Jackson hit three homers on three consecutive swings off three different Los Angeles pitchers in the sixth and deciding game of the World Series. Only one other player (Babe Ruth) has ever hit three balls into the stands during a single World Series game. Years later, in 1995, Murray was nearing the end of his career with Cleveland, while teammate (and eventual fellow 500 Home Run Club members “Big Jim” Thome was in just his fifth year in the bigs. After seeing his Game 2 home run go for naught, Murray won Game 3 for the Braves with an RBI single. During Game 5, Thome crushed an offering from Atlanta Braves’ pitcher Brad Clontz 436 feet, which became the eventual game-winning run. In addition to being one of the most entertaining and popular players ever to wear a Red Sox uniform, Manny Ramirez (507+) helped the team win two World Series titles in four years with timely hitting that raised his post-season home run tally to a MLB best 24. He has a total of four World Series home runs - three with Cleveland and one with Boston, but his long ball during the 2004 Red Sox World Series home run couldn't have come at a better time. With his team up two games to none Vs. National League champions St. Louis, Manny slammed a first inning home run in Game 3 to keep the momentum going. The Red Sox went on to sweep the Cardinals to take home their first MLB Championship in 86 years.